The magic of a moment sometimes lies in the silence of the eyes and sometimes lost in the words…it would not be until much later, that Inspector Rana would understand the true meaning of it. Inspector J S Rana fixed his belt and tugged his cap, looked squarely in the mirror and admired his thick moustache perfectly curving up. His sharp rajputana features made him look really aristocratic in the department. Quite unlike a crime branch investigative official, to say the least. He had just been transferred to Mumbai from Rajasthan about a fortnight ago. ‘Sir your lemon tea.’ Interrupted Gopinath Thirkey. ‘Tharki –how many times have I told you not to interrupt me while I am fixing my moustache?’ he said with a hint of mock seriousness. ‘Sorry Sir I am Thirkey not Tharki’ he objected rather meekly. ‘Ah right, maybe next time’! ‘So, what are the cases today’ he asked dismissively. ‘Ok, let’s have a look at it then’. ‘I really wonder what will ever come of it – it s the same story from Rajasthan to Rourkela, from Kashmir to Kanyakumari, ...and from north Mumbai to south Mumbai. There was a slight hint of sarcasm in his voice mixed with exasperation. ‘But you know sir what’s different in Mumbai… ? Just for a split second Inspector Rana gave a sharp glance at head constable Thirkey. A nervous Thirkey blurted…‘Yes sometimes I wish my wife would get lost…..but she…’ Gopinath trailed off as he saw inspector Rana’s converging eyebrows.Thirkey knew it was time to leave the room. As Inspector Rana began flipping the pages of the missing persons file, one photo caught his attention. His roving eyes stopped on an old black and white hazy photograph of a small boy.The face was barely visible after all these years of dust and neglect. ‘Tell me about this case’ Inspector Rana gestured showing the page to Gopinath. ‘Hmm, you are probably right, I think we should, it s just that this boy’s photograph seems a little familiar… you know , where have I seen this boy ? His eyes remind me of …of someone I know…but just can’t seem to place him correctly’ Inspector Rana trailed off. ‘Hmm forget it – close the file, if we don’t hear from the last known contact person – call them, visit them do whatever, if we are still clueless then we will close the file in 14 days. Ok tharki? ‘Yes sir’ said the head constable pursing his lips. As days passed by, it became increasingly evident to Gopinath Thirkey, that this case was going to be closed soon. He had made absolutely no headway in the case. With Jack Daniels for company, inspector Rana sat by the window, and kept searching his memory - present to the past. He opened the old teak wood chest of drawers and took out the family album. His childhood memories came back flooding - That joint family, those lush fields, that splendid haveli, always decorated and so full of life, and his friends always up to mischief. In one photograph with his friends, he was caught stealing guavas from the garden.The look on his face was spectacular – shocked and embarrassed at the same time and his friends looking on sheepishly. So many years had passed since then, but it still managed to evoke the same nostalgic feeling. But this time nostalgia was short lived. Suddenly that photograph triggered a strange feeling of discomfort. He felt uneasy. Something was not right. He dashed to the study table nearby, and opened the missing person’s case file he’d brought home. He saw the photograph there and the one in his family album with astonishment. He studied the photographs again, this time under the magnifying glass. The result was the same. Veeru’s eyes had an uncanny resemblance to his eyes. ‘How odd is that – how can two different people from different times and different cities have the same eyes. ?’ Inspector Rana’s mind was buzzing. ‘Nothing Tharki it’s just that this case is bothering me a bit more than I thought it would’. ‘No hold on. Not just as yet.’ said Inspector Rana interrupting. ‘In fact I wanted some help from you - look at the photograph in the file carefully once more, and tell me, do you see anything similar in this photograph?’ inspector Rana handed over his childhood photograph. ‘Sir I am not sure if it is my eyes, but do you notice something strange’? ‘Idiot, that’s why I asked you to see it’you tell me what you see’ inspector Rana snapped. ‘What?’ a puzzled inspector Rana exclaimed. ‘Well, it almost seems like, it has come back to life…’! Gopinath’s looked up with his hands shaking. ‘Don’t you notice the eyes’? For a second Inspector Rana breathed a sigh of relief, maybe he was imagining it all. But that was not the end of the surprise…it was only the beginning. As Inspector Rana took the file back from Thirkey and glanced on the photo once more, he slumped into the chair with his hand shivering….and body trembling. ‘What happened sir’ Gopinath mumbled. Inspector Jayveer Singh Rana sat there bewildered, shocked and speechless…the boy in case file photograph looked exactly like the boy stealing guavas. Gyanban Thoughts - This story has no element of reality and is 100% fiction.The element of deja vu is something we all go through in life.Who knows there might be some hidden message somewhere.In this story, there is a possibility of part 2.I would like to know what happens after this ? What does Inspector Rana do about the case? Why is there is a similarity in the pictures? Or is it just a figment of his imagination? I' ve deliberately strewn clues in the story right through the pages...maybe one of you will bring it up in the comments. Btw, this new template made me nostalgic....i lived with it almost for 1 year. Deja Vu is something we all experience.. but it never shook me like how you have explained which makes this an interesting read. Waiting for Part 2. Yummy yummy story..left us impatient for more. 2. The sharper image of the black and white. May be it was a tampered picture to distract the investigation. @abha - thanks and welcome to Scrambled egg!! Well I am not sure if there is a part two to this but let see where it takes us in time. @mahesh -yes this template is loading much quicker than before ,so for those who have a slower connection it is a good thing. @Vibhushan - like i said before part is just a guess, am not sure at this point if this could spin out to one. @Thanks Purba - am glad you liked it. @LakshmiRajan - that's a good start - good clue but not the exact one. @Lakshmir Rajan - part 2 - yes that could be an angle. @Masood - aha - you seem to have caught the drift. Could be one of the angles. Very intriguing story! !I've come to expect this of you :).....can't wait for part-2!I hope you plan to come up with a sequel. P.S. The pic... very apt. 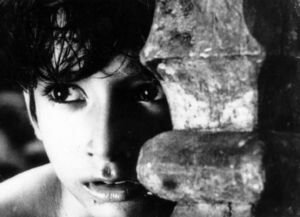 Pather Panchali is truly a classic. @shahid - yes I will certainly,if I manage to find it out myself. @Magicquill - well thank you. @Roshmi - thanks and the photo is very haunting indeed. @Mahesh - a very nice gesture.Thanks. I liked the interesting way you've prompted your readers to give you clues to lead to a sequel. I sometimes write stories in parts, though none of them have been thrillers, but letting your readers share how they think the story will end gives loads of options to the writer. I agree with the possible clues picked up by Lakshmi Rajan in particular. Brilliant...you have made a Basanti out of the reader ! !